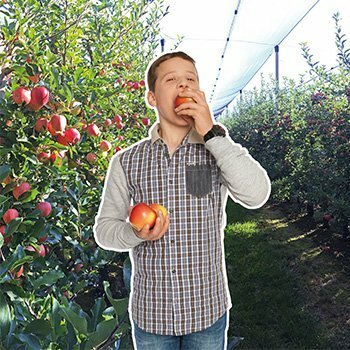 For each apple variety, the graft condition is essential for the sapling quality. For genetically unstable varieties such as Gala, Fuji or Red Delicious, high quality grafts are even more important. At Gruber Genetti, we carry out strict checks and graft selections so we can provide high quality trees for your orchard. Genetically stable apple tree varieties, such as Golden Clone B, flourish on MM111 rootstocks that grow more strongly (non fruit bearing with stronger growth), while genetically unstable varieties, such as Gala mutations, grow on M9 rootstocks (fruit bearing with less growth). The advantage is that, in the case of unstable varieties, the fruit can be checked, enabling more efficient selection. On behalf of Schniga GmbH, owner of the Schnitzer, SchniCo and SchniCo red Gala mutations, we produce grafts in our own CAC graft mothergardens in Verona. Owing to the instability of Gala mutations, the apple trees are subject to particularly strict checks. 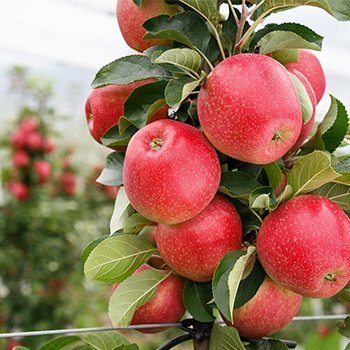 In order to guarantee authenticity of the variety, SchniCo and SchniCo red, as opposed to the stable tree varieties and mutations, are located in our graft mothergardens – on the M9 rootstock. Every year, just before the harvest, our apple trees are checked pomologically. This means that if fruit on a tree does not have the colour typical for the mutation or there are other discrepancies, no grafts will be cut from that particular tree. If there are discrepancies in two consecutive years, those trees will be removed from the mothergarden. These checks are made possible because of the early ripeness of the fruit in Verona: the Gala apple variety ripens between the end of July and the beginning of August, meaning the colour of the fruit can be assessed before cutting the graft. All apple trees in our mothergardens are pomologically checked every year, and they will only be used to obtain grafts after a positive assessment. As a visible sign of recognised quality, our South Tyrolean nursery constantly provides proof of quality - the label of national certification, which we receive from the Agriculture Department of the Veneto/Italy region, vouches for this. It guarantees the proof of origin from selected mothergardens and virus-free rootstock. The label is a special quality promise with the guarantee of the variety’s authenticity, health and quality of the apple saplings. Classic or innovative varieties? All about our varities ..